Learn about travel in Kansas, by reading KANSAS—Heir to History—Air to the Future by Charlie Spence, Travel Writer and WTA Member. It features a mini, but thorough tour of the destination, plus all you'll need to know to plan your trip including getting there, objective information on places to stay and eat, and things to do. At the end of the article, we've provided a summary of the contact information for your easy reference. Enjoy! Where can you go back in time and forward in time while enjoying the present day? Kansas, of course. Mosey along the Ol’ Santa Fe Trail into Dodge City and watch a noon showdown on the dusty street and you almost hear the squeaky wheels of the wagon trains carrying you back to the time when Kansas had important outposts for those journeying west. About a hundred miles east, Wichita shows why it rightly deserves the title of Air Capital of the World. Celebration of the 100th anniversary of the Wright brothers’ first successful powered flight makes Wichita the ideal place to start your visit. About 60 percent of the general aviation airplanes in the world are made here and the town has long looked to the sky and the future. It was here that three men—Clyde Cessna, Walter Beech, and Lloyd Stearman—started the TravelAir Company to build airplanes. This was just 22 years after the Wright brothers made their first flight. (Shortly after this they each went their separate ways because of differences over design concepts.) It was here, too, that Bill Lear developed the first business jet aircraft. Today, five aircraft manufacturing companies are located in Wichita. Right at the Mid-Continent Airport you will find a museum to this aeronautical history, housed in what was the first terminal building. Here you will see chronicled 90 years of development of general aviation. Now, let's head over to the Exploration Place for extraordinary hands-on experiences. Lie horizontal and simulate flying over the sand dunes of the Carolinas like the Wrights and then take a heart-thumping simulated flight with the Blue Angels military aerobatic team while sitting in a full-motion theater seat. 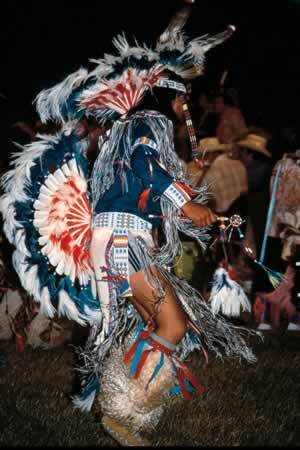 Native American dancer at a Pow-wow. Aviation is but one of the attractions. You find a rich heritage in Wichita and all of Kansas. The Kanza Indians once inhabited this region that is named after them. At one time, more than 30 different tribes lived here, but as expansion pushed farther west, many were forced to move to Indian Territory—Oklahoma. Four tribes, however, remained. If you visit at the right times, enjoy some of the colorful pow-wows. The Mid-America All Indian Center Annual Intertribal Pow-Wow in Wichita draws thousands of American Indians from across the nation. Check the web site—www.theindiancenter.com—for information about this and what you can find in this museum. While in the museum mode, go down Douglas Avenue to the Jessie James Museum. You might be in for a surprise if you thought Jessie died when “a dirty little coward laid poor Jessie in his grave.” A new book by the museum’s director declares that Jessie faked his death and started a new life in Kansas. Jessie James the 5th is on hand daily in the museum where admission is free but contributions are welcome. With this journey back in time you’re ready to drift on down to the Old Cowtown Museum to get a glimpse of what frontier life was like from 1865 to 1880 when buffalo hunters and cowboys trod the dusty streets. This 17-acre museum has 36 furnished buildings—a working blacksmith shop, city marshal’s office, saloon, and cowboy camp. Take a ride in a Conestoga wagon or stroll along the Arkansas River. (Here, you’d better call it Ar-KANSAS and not Arkan-SAW!) Cowtown is open April through October. After the Civil War, populations started heading west in larger numbers and in that migration Kansas had an important role that shows today in many of the towns. The old Chisholm Cattle Trail, the Santa Fe Trail, and Oregon Trail lead through some of the historic frontier communities. Historic forts like Fort Leavenworth, Fort Scott, Fort Riley, and Fort Dodge are reminders of when the military guarded the trails. Make Fort Dodge your next stop. Gunfight at the Boot Hill Museum. Lawless days of Dodge are re-enacted daily during the summer months. You know you’re in the remnants of the frontier days as you see the street signs carrying names like Gunsmoke, Trail, and Wyatt Earp Boulevard. Thousands of wagons traveled over the Mountain Branch of the Santa Fe Trail, which went west from Dodge. Fort Dodge was established in 1865, offering protection to these wagon trains and serving as a supply base for the military engaged in the Indian wars. Nine miles west of town you can see Santa Fe Trail tracks, ruts made by the heavily laden wagons. Your first visit to this historic city will be at the fort, five miles east of town, which now is a home for retired veterans. Several original buildings of the old fort still remain, including the commanding officer’s quarters, enlisted men’s barracks, and the post hospital. Only half of the quartermaster’s warehouse remains but in it a library and museum transport you back to those rugged days. Go into town and see why this is a pure definition of the old west. At the Boot Hill Museum you learn to “smile when we say that, pardner,” finding that in the early days there was no law here and the old Boot Hill Cemetery, which is now a part of downtown Dodge, welcomed many souls who faced off on the dusty streets. 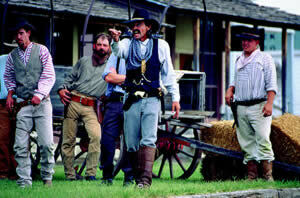 Stick around and you’ll see these gunfights re-enacted on Front Street by costumed residents. But law did come to Dodge in the form of “Bat” Masterson, Charlie Bassett, and Wyatt Earp. From these lawmen evolved the fictional character Marshall Matt Dillon in TV’s Gunsmoke. At the Gunfighters’ Wax Museum you’ll see life size figures of these and other famous people who made Dodge the personification of the old west. Miss Kitty and the girls put on a show each evening during the summer at the Longbranch Saloon. Walk along Front Street and drop in at the Long Branch Saloon and, if you’re lucky enough to be here during the extended summer months, catch the Longbranch Saloon Variety Show. Then, move on to look over the gun exhibit while waiting for the arrival of the stagecoach, which will take you for a guided tour. Over by the railroad station is a 1903 steam locomotive reminding us that when the railroad replaced the wagon trains, Dodge became a major railroad stop. You’ll find out that right there on Front Street the term “Red Light District” was coined as the train masters took their red caboose lanterns along when they went to visit the town’s “soiled doves.” At sometime during your stay you will want to hop aboard the Dodge City Trolley and learn a lot more about the town’s folklore as you visit the actual sites where western history was made. Wichita: Almost a dozen major and regional airlines serve Wichita’s Mid-Continent Airport offering a wide variety of arrival and departure times. The usual rental car companies are at the airport. You will want to have wheels available to visit the many attractions here and to see other Kansas sights. Dodge City: Regional airlines serve the Dodge City Airport with connections from many cities. Wichita has a wide range of lodgings with an equally wide range of prices. A Days Inn on East Kellogg, for instance, offers rooms under $50. At the other end of the scale, The Castle Inn Riverside, a small luxury inn, serves complimentary hors d’euvres, wines and liqueurs with a tab well over $100. The Hyatt Regency and the Radisson Broadview in downtown nearer the Convention center offer accommodations between $75 and $100. Dodge City has 13 motels offering a combined total of 700 rooms. Accommodations here vary with rates depending on seasons. Examples: Budget Lodge on E. Wyatt Earp St. has 32 rooms with rates in the $30 to $85 range. The Dodge House Hotel with 108 rooms charges $55 to $125. Marchel Ranch $95-$100. Boot Hill B&B $79 to $139. Use WTA's Travel Booking Service that may offer deep discounts at many hotel properties, plus you can book rental cars and vacation rental properties. For a fine selection of places in Wichita to dine, log on to www.360Wichita.com and take a look at many of the fine eating places. In Dodge City try the Silver Spur Steak House, Del Monico’s Steakhouse, or Chuckwagon Cafe. Notice: This information is current as of June 2003. It is recommended that you contact the numbers, and/or visit the web sites above to determine any changes to the information.